Passport is a global market research database providing statistics, analysis, reports, surveys and breaking news on industries, countries and consumers worldwide. Passport connects market research to analysing market context, competitor insight and future trends impacting businesses globally. Passport covers more than 200 countries and regions. It is useful for company information too. 1) Industry data – multi-country relational database of market and category sizes, market shares, distribution patterns, sales forecasts and other measurements relevant to each sector. 2) Country reports – in-depth analysis reports on both developed and emerging national markets. Each report provides qualitative commentary on sales trends, new product and marketing developments, consumer preferences, national company and brand competition and market strategies, and the views and assumptions underlying national sales forecasts. 3) Global reports assessing the key issues affecting international market performance, with a focus on important developments by product sector and big picture competition strategy. 4) Company profiles – analytical profiles of the top international players in the industry, compiled in a standardised format for cross analysis. 5) Comment – articles and presentations on key themes and discussion topics around the dynamics of the category. This video (aimed at their corporate clients) describes what Passport does. 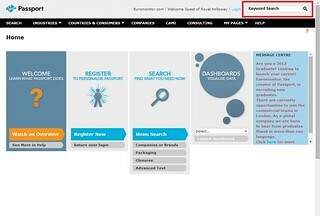 You can search by Keyword from the main page by entering your keyword in the search box in the top right hand corner. If you click on search in the top left hand corner something called tree searching appears. specific within that sector e.g. beer and/or cider. You then choose world region or countries. You can then run your search or decide to only display the data/statistics. statistics or analysis and date. Which countries are largest by size? Which are the top companies in this sector? The Dashboards visualise Passport data and help users see the information in a different way. 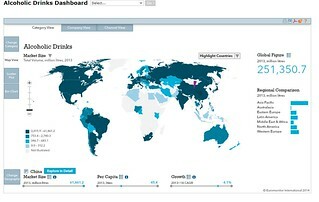 You can explore trends in a visual format using the interactive world map. This data can also be downloaded using the options above the map. Clicking on Search to reveal different options. 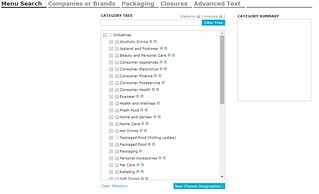 If you click on Companies or Brands you can be more specific with searching. Depending on the report type displaying you’ll see different options. You can either open the file in excel, export as a PDF or save to My Pages or print. and return to saved saved or downloads.